Patients with colon cancer usually contact us if chemo or radiotherapy is not enough to kill malicious tumors while metastases continue to grow. Or if they want a workable alternative to the conventional medicine. Questions patients put are plentiful, but most of them relate to the Rigvir® healing effect, medical reports they need to submit, and more. For you to see the full picture, we’ve collected all the virotherapy care essentials down below. Read on and feel free to ask us anything we have occasionally left out. Rigvir® origin and therapeutic effect. Originally, Rigvir® virotherapy was discovered and examined in Latvia, Riga in 1960-1970 by the Latvian scientist and immunologist, Aina Muceniece, and her team. In 2002 the medicine was patented and registered as an effective treatment for melanoma in 2004. The medicine is based on a non-pathogenic virus found in the kid digestive system (so called Enteric Cytopathogenic Human Orphan or ECHO-7 for short). It hasn’t been genetically modified since then and does not contain any stimulants or antibiotics. Having discovered Rigvir for melanoma, the scientists revealed it can help cure a number of other oncological conditions including colon cancer. 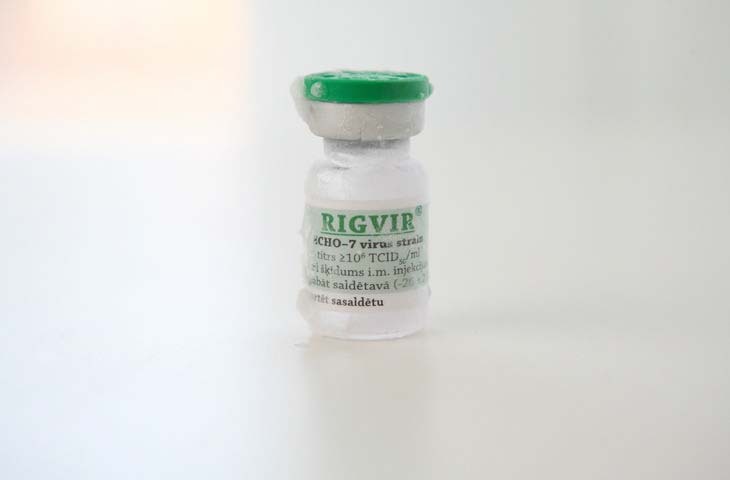 The Rigvir® therapy is carried out intramuscularly with injections. The care plan is regularly adjusted. It is done by both the Latvian oncologists and a patient’s home-based oncologist to ensure better therapy effect for each particular case. The main advantage of virotherapy for colon cancer is that it targets only the tumor. The virus multiplies inside it destroying the cancer cells. No healthy tissues are damaged. Furthermore, the virus does not reproduce itself in your body preventing any anomaly from taking place in the future. Rigvir® is a good fit to fight back colon cancer. Rigvir® can be applicable to patients over 18 years old with solid tumors only. No clinical trials proved that the medicine can treat pediatric cancers. Additionally, you must have a confirmed cancer diagnosis to qualify for virotherapy, since it is not suitable for preventive treatment. Possible side-effects caused by virotherapy for colon cancer. So far no serious side-effects have been registered. Virotherapy can only lead to minor growth of temperature (37.5°C / 99.5°F), sleepiness or fatigue. Rigvir® stimulates your immune system to resist the cancer and such changes in body state occur naturally. It means that virotherapy can be safely combined with radio or chemo. Shipment of the Rigvir® vials. AfterRigvir® was officially recognised by the Latvian state authorities, it was further legally adopted by Armenia (2016) and Georgia (2015). Still, the Rigvir® vials can be shipped worldwide including English-speaking countries (New Zealand, Canada, Australia, the UK and US). Blood biochemistry incl. ALT (alanine aminotransferase), creatinine, etc. The initial case review is absolutely free. However, please make sure the medical files you provide are in English or Latvian. 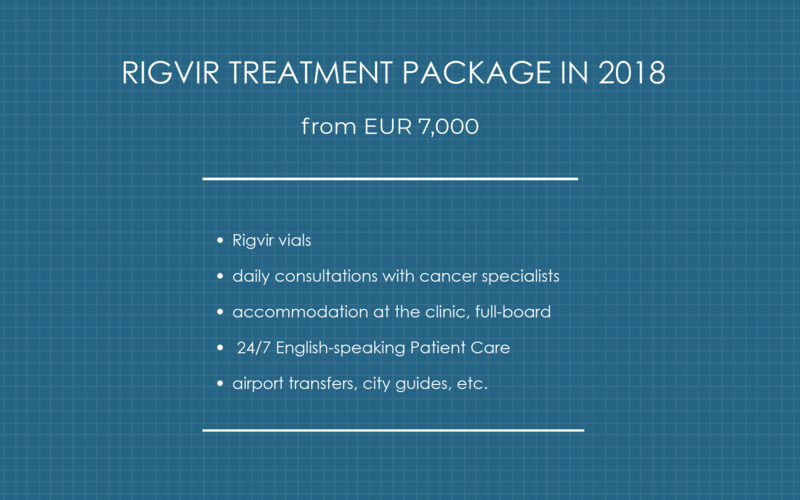 Below you can find the basic information about the Rigvir cost. Hopefully, the article helped you dispel all doubts. Still, there might be something bothering you like transfer details, shipping time, or frequency of follow-up consultations after you return home after the treatment. Please click the red button below and address your inquiry. We will respond within 24 hours or even faster.